I love fig season but hate how short it is. I only had a few weeks this year to enjoy figs from my mother in law’s tree before they were ruined in a terrible storm (all of the fruit was bruised). I’m hoping we get a few more before the season is over but we’ll see. Fig season has been a big deal in my family for as long as I can remember. My dad used to pick buckets of them and make fig preserves every summer for my mom. I came home from work one day last week and my mother in law had dropped off these Fresh Fig Bars. They were delicious. Kind of a cross between a Fig Newton and a traditional crumb bar. The fresh figs were truly the star of these bars. I can’t wait to make these for my mom. I know she will love them. 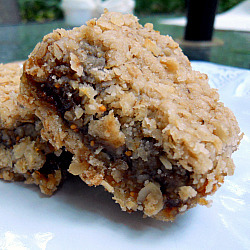 If you have access to fresh figs, these bars are a great way to use them! In a medium sauce pan, combine figs, water, honey, 1/4 teaspoon salt and lemon peel. Simmer about 1 1/2 hours, stirring occasionally. Combine the 2 tablespoons of flour and water and stir into fig mixture. Let cook five minutes longer, stirring constantly. Remove from heat and stir in lemon juice and walnuts. Preheat oven to 350 degrees. Prepare an 11 x 9 baking dish with cooking spray or butter. In a stand mixer fitted with the paddle attachment or using a hand mixer, beat together butter and brown sugar until light and fluffy. Combine flour, 1/2 teaspoon salt and oats and fold into butter mixture. Pat half of oatmeal mixture into bottom of pan and spread fig filling evenly over. Sprinkle remainder of oatmeal mixture over the filling and press lightly with a fork. Bake for 30 minutes, or until golden brown. Let cool and then cut into squares and serve. Oh wow, I cannot wait to try out these beautiful fig bars. That filling alone sounds like it would great on toast. Mmmm! I am loving the looks of those fig bars! I have some more figs to use up too, but I’m torn between these and the fig upside-down cake! Maybe I will have enough to make both. Do you think these would be good with some whole wheat or white-whole wheat flour subbed in, or should they be kept lighter with plain AP flour? on October 5, 2011 at 8:47 pm | Reply Fresh Fig Bars « Oishii! You inspired me to try making fresh fig filling for my Fig Newtons. Thanks! This recipe looks yummy! This may be a dumb question but as this is the first time I have cooked with fresh figs do you peel or cut up the figs or put them in the pan whole to simmer? These bars are awesome! It’s so nice to realize that figs aren’t just the sad little dried brown things in vacuum-sealed bags…they are a fresh and delicious fruit! These bars, though, are very, very fragile and I was thinking the bottom “crust” layer should be baked first?